U.S. Dept. Commerce Silver Medal Award (1981) and Gold Medal Award (1985) for fire modeling and research. Russell Severance Springer Visiting Professor, Dept. of Mechanical Engineering, U.C. Berkeley (1985). Invited Lecturer, Second IAFSS Symposium, Tokyo (June, 1988). Medal of Excellence, IAFSS, for urban fire model (1991). U.S. Delegate, Japan - U.S. heat Transfer Joint Seminar (1991). Japan Society for Promotion of Science Fellow, Tokyo University, Institute of Industrial Science, Murakami and Kato Laboratory (1994). Invited Lecturer, Sixth International Conference on Numerical Combustion, New Orleans (1996). Arthur B. Guise Medal, Society of Fire Protection Engineers, for fire simulation research (1999). Phillip Thomas Medal of Excellence, IAFSS, for corridor smoke modeling, (1999). Fellow and Charted Physicist, Institute of Physics, (1999). Long Term Visitor, Institute of Mathematics and its Applications (IMA), Univ. of Minnesota, Program on Reactive Flow and Transport Phenomena (1999). National Academy of Engineering (2000). Invited Lecturer, Third International Seminar on Fire and Explosion Hazards, Lake Windermere, U.K., (April, 2000). Invited Lecturer, Third International Symposium on Scale Modeling, Nagoya, Japan, (Sept. 2000). Arthur Newell Talbot Lecture, Dept. of Theoretical and Applied Mechanics, Univ. of Illinois, (Mar. 2002). Invited Lecture, Second NRIFD Symposium - Science, Technology, and Standards for Fire Suppression Systems, Mitaka, Tokyo, Japan, (July 2002). Howard W. Emmons Invited Plenary Lecture, Eighth IAFSS Symposium, Beijing, (Sept. 2005). Invited Plenary Lecture, APS Division of Fluid Mechanics Annual Meeting, Chicago, (Nov. 2005). U.S. Dept. Commerce Group Gold Medal Award for contributions to World Trade Center Investigation (2005). Distinguished Paper Award in Fire Research Colloquium, Thirty-First International Symposium on Combustion (2007). NIST Gallery of Distinguished Alumni (2007). NRC Naval Studies Board Panel "ONR Research Activities in Sold and Fluid Mechanics" (1986, 1991). NRC Panel "Status of Nuclear Winter Research" (1987). NRC Committee on Microgravity Research (2001 - 2004). Member Editorial Board, Combustion Theory and Modeling (1997 - 2006). Member Editorial Board, Combustion and Flame (2001 - 2006). Member U.S. Panel, U.S. - Japan Natural Resources (UJNR) Panel on Fire Research and Safety (1996, 1998, 2000), Associate Member (1988, 1992). Board of Visitors, Dept. Fire Protection Engineering, Univ. of Maryland (2004 - 2006). Hurricane Intensity Research Working Group, National Oceanographic and Atmospheric Agency (NOAA), (2005-2006). 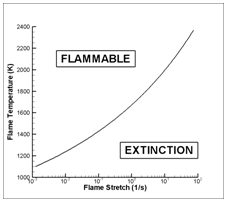 Total flame extinction is frequently observed in fire configurations, for instance as a consequence of fuel burn-out, oxygen depletion, or activation of a fire suppression system. Total flame extinction may be viewed as the result of the cumulative action of individual events known as local flame extinction. flame extinction is responsible for reduced levels of the heat release rate and increased levels of emission of products of incomplete combustion (e.g., carbon monoxide, unburnt hydrocarbons, soot); the reduced levels of heat release rate correspond in turn to a decreased risk of fire spread; the increased levels of carbon monoxide and unburnt hydrocarbons emission correspond to an increased risk of toxic poisoning and in some cases, to an increased risk of explosive combustion (e.g., backdraft phenomena). 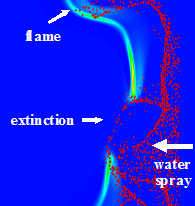 Diffusion flames may be extinguished by a number of different mechanisms: aerodynamic quenching due to excessively fast fuel-air mixing; thermal quenching due to excessive levels of heat losses (e.g., radiant cooling, convective cooling to cold wall surfaces, or water evaporative cooling in fire suppression applications); dilution quenching due to excessive changes in the composition of the fuel or oxidizer supply stream (e.g., air vitiation in under-ventilated fires). Laminar flame theory suggests that all these different phenomena may be explained by a single flame extinction criterion known as a Damköhler number criterion. Current work is focused on the following two major components: (1) gain some fundamental understanding of diffusion flame extinction/re-ignition phenomena through direct numerical simulations (DNS) and large activation energy asymptotic (AEA) analysis; (2) formulate a new flame extinction model, implement that model into a large eddy simulation (LES) solver called FireFOAM (FireFOAM is a fire modeling software developed by FM Global and is based on the open-source general-purpose CFD software package called OpenFOAM), and perform validation studies. V.R. Lecoustre, P. Narayanan, H.R. Baum, A. Trouvé (2011) “Local extinction of diffusion flames in fires,” Fire Safety Science – Proc. Tenth International Symposium, International Association for Fire Safety Science (IAFSS), 583-595. P. Narayanan, H.R. 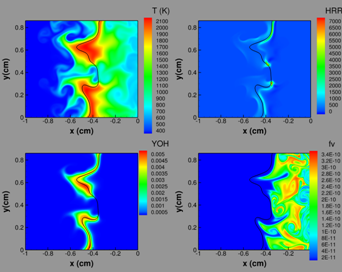 Baum, A. Trouvé (2011) “Effect of soot addition on extinction limits of luminous laminar counterflow diffusion flames,” Proc. Combust. Inst. 33:2539-2546. Dr. Vivien R. Lecoustre is a Research Associate in the Department of Fire Protection Engineering. For further information about his research, he can be contacted at: vlecous1@umd.edu. Sébastien Vilfayeau is a Doctorate Student in the Department of Mechanical Engineering. For further information about his research, he can be contacted at: svilfaye@umd.edu.